that's the underside of the intake manifold?? I'll have to see of I can feel it. 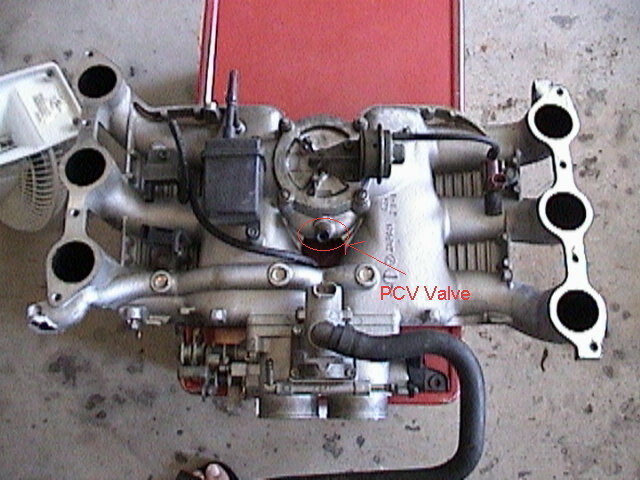 Is it even serviceable w/o removing the manifold? Yes it is, fortunately, if you pull the black cover plate off the center of the manifold, you can see it, but read this thread before you try. Here is the pdf document with photos of the PCV replacement process. Found in the Engine section of the How-to documents. NOTE: The PVC is mounted from the bottom of the manifold and so everything is reversed when removing it from the top; the wrench is turned in the opposite direction of what you would think. This is also noted in the instructions. When removing the valve from the top, turning the wrench CLOCKWISE actually loosens the valve. Turning it COUNTER-CLOCKWISE actually tightens it.